Two titans of conservative media are feuding over... Ronald Reagan? It's understandable if that sounds unusual, given the near-universal celebration of the 40th president on the right. But Fox News host Bill O'Reilly's new book, "Killing Reagan," is drawing criticism from some of his ideological peers, most recently syndicated columnist George Will. On Thursday, Will wrote a blistering takedown of the book, the latest in O'Reilly's ultra-successful series of historical blockbusters. He argues that it "will distort public understanding of Ronald Reagan's presidency more than hostile but conscientious scholars could." Will called the book a "tissue of unsubstantiated assertions," taking issue with O'Reilly's "intimated hypothesis" that the 1981 assassination attempt on the president "somehow triggered in Reagan a mental decline, perhaps accelerating the Alzheimer's disease that would not be diagnosed until 13 years later." "The book's perfunctory pieties about Reagan's greatness are inundated by its flood of regurgitated slanders about his supposed lassitude and manipulability," wrote Will, who serves as a Fox News contributor. "This book is nonsensical history and execrable citizenship, and should come with a warning: 'Caution -- you are about to enter a no-facts zone,'" he added, mocking O'Reilly's signature "no spin" phrase. On Thursday night's edition of the "O'Reilly Factor," the top-rated host in cable news fired back at Will. "A very interesting thing happened today on the book front. George Will wrote a column entitled 'Bill O'Reilly slanders Ronald Reagan,'" O'Reilly said. "But it is his column that is a libel. Slander is a spoken word, George. Libel is a written word. I'm sure you know that," he continued, appearing amused. 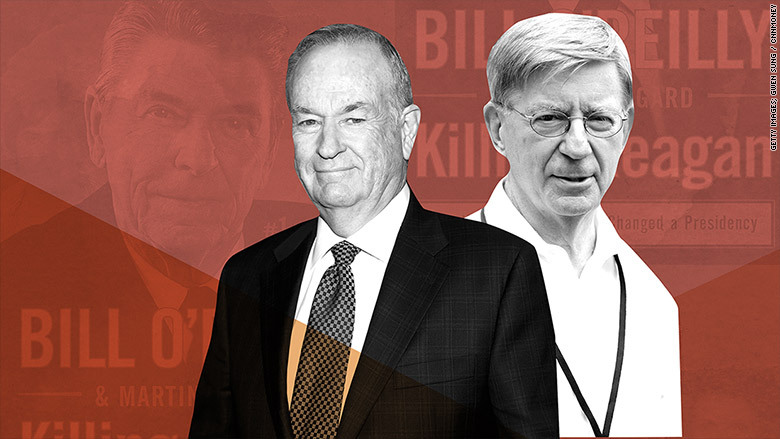 "George Will regurgitates attacks on the book from Reagan loyalists who tried to get the book 'Killing Reagan' spiked even before it was published because they wanted a deification of the president, not an honest look at him." A Fox News spokesperson told CNNMoney that Will is scheduled to appear on Friday night's edition of the "O'Reilly Factor." "Killing Reagan" represents yet another hit for O'Reilly. The book, which O'Reilly co-authored with Martin Dugard, sits atop the New York Times bestseller list for nonfiction, a spot that it's occupied for five of the last six weeks. The book was published by the Macmillan imprint Henry Holt and Co.
O'Reilly's "killing" franchise -- titles on Abraham Lincoln, John F. Kennedy and Jesus, among others -- sold nearly 7 million copies prior to the latest release. But "Killing Reagan" has put O'Reilly in the unusual position of defending himself against conservatives with whom he's usually in agreement. The right-wing radio host Mark Levin tweeted Thursday that "George Will is right" to say that O'Reilly "slanders Reagan." "Numerous real historians & I have said so as well," Levin said. O'Reilly anticipated the criticism, saying in September that Reagan's supporters simply wanted a hagiography. "Well, the heat I'm getting from 'Killing Reagan' is that I didn't do him as God," O'Reilly said. "We just portrayed him as a man, and all men have strengths and weaknesses."